Chandler, David G. On the Napoleonic Wars. London: Greenhill, 1999. 272 pages. ISBN# 1853673498. $19.95. Paperbound. This is the best book David Chandler has written, put together, or edited, or all three. I dragged my feet getting it, and it is now one of the most valuable in my collection. Consisting of 16 essays on the period, it has some information that is hard to come by, and they are presented in the usual crisp narrative we have come to expect from David Chandler. The chapters are presented in chronological order and range from the reconquest of Egypt in 1801 through the battles of Maida and Sahagun to the strange but fascinating tale of an undergroom in 1815. The two best chapters, in my opinion, are on Maida 1806 and Marengo in 1800. Chandler covers Maida in a much more thorough, accurate manner than Oman did in his Studies in the Napoleonic Wars, and the chapter on Marengo covers, not the fighting on the battlefield of June of 1800, but the frustrating writings of the three versions of the battle by the French. In the essay on Marengo Chandler tells of Colonel Pascal Vallongue of the Depot de Guerre, an honest officer trying to do his duty, and producing a generally accurate version of Marengo in 1803. First pleasing Napoleon, the then First Consul orders a changed rewrite that has the battle going exactly as planned. All copies of the original are ordered burned, but a War Ministry clerk saves one by hiding it under his blotter. The report is changed yet again, and Chandler lays out the sequence of confusing events in such a way that it is clearly understood who did what, when, and where. 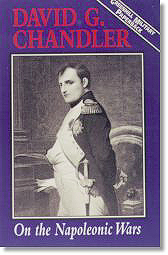 The weaknesses of the volume are the last two chapters where Chandler again attempts to analyze Napoleon as well as comment on a 'Jominian Legacy.' In my opinion, he largely fails here, and it is another attempt to try and fit a square peg in a round whole, attempting to reconcile Napoleon's method of waging war into a formula, and the use of Jomini, because of Jomini's myriad inaccuracies, fatally hurts the analysis. Still, this is a most valuable book that should be read by all students of the period. It is entertaining, lively, and except for the last two chapters, some of the best work Chandler ever produced.